I hope you don't mind that I invited this nutty band of weekend warriors to join us today as we engage in an activity that will keep even the wiggliest preschooler busy for a long, long time - Simple Saturday Nuts and Bolts for Wee Ones. 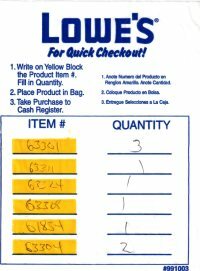 As you can see, I have posted my Lowe's Hardware shopping list on the right. However, if you've got a handful of large to middle-sided nuts and bolts in a cup somewhere, that will do fine. So, all the kiddies have to do is simply match the nut's diameter to the correct bolt and twist them together. That's it! What were you expecting? This is Simple Saturday, after all, isn't it? If you want to get all organized about the process (which I tend to do), have the child sort the nuts by classifying them by size. Line them up all neat-like, if you wish. Then put those puppies together. That's all there is to it! To add to the fun add washers to the mix. Pile 'em all up, sort them out and twist them together. Can you believe fun like this can be so gosh-darned inexpensive? I love it!